Sometimes Myanmar was deceiving. So much of what I saw in the country was ancient that it was easy to feel that every temple and pagoda had a history going back to the distant past. Much of the country seemed frozen in time, and sometimes I had to remind myself that some places felt much older than they actually were. Panorama from 10 vertical shots in 2 rows, additional exposures for highlights, focal length 14 mm, aperture f/8, shutter speed 8 seconds, ISO 250, tripod. That was the experience I had at the Bagaya Monastery in the town of Inwa, not far from Mandalay. Though the town itself is one Myanmar’s earliest capitals, the monastery was a newcomer compared to many of the others I’d explored; it looked and felt much older, but the monastery was only built in 1834. 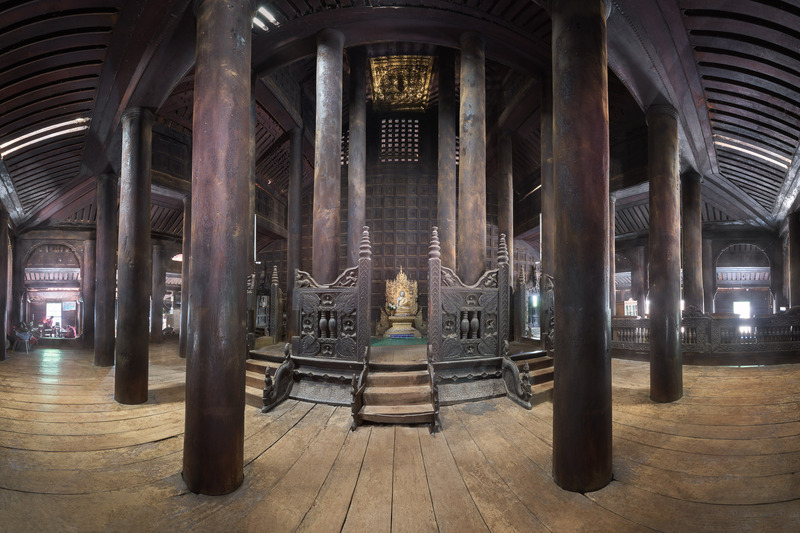 Unlike many of the monasteries that I toured in Myanmar, the Bagaya Monastery was built entirely of teak, including the 267 pillars which supported the building, the largest of which is 60 feet tall and nine feet in diameter. Intricately carved lotus motifs were repeated throughout the building. I wouldn’t have imagined it was possible, but I found it even more splendid than the teak wood monastery in Mandalay. Bagaya is still a functioning monastery. As I walked through the halls, camera in hand, I realised that in a room to my left, monks were gathered in study. As was often the case when I encountered monks in Myanmar, they were oblivious to me. Focused on their studies, or perhaps in prayer, they seemed completely unaware that anyone else was in the temple. I took my photographs and left quietly, leaving them to the silent rituals of their ancient faith. This entry was posted in Interior and tagged Inwa, Myanmar.